They're finally in bloom. Hallelujah. Could all this beauty, all these different colors, really come from the same plant? Amazing. As I arranged these for a bridal shower, I started thinking about the bride. She's pretty; she's sweet and kind; she's incredibly intelligent; she's funny; she's thoroughly modern in some ways and touchingly traditional in others. Amazing. Wasn't it kind of God to make so much of His creation an echo of the depth and complexity of His being? He could have kept His goodness all to Himself. But He chose to share it with us. I LOOOOVE Hydrangeas! They were one of my mother's favorite too. What an awesome God we serve! Thanks for posting the beautiful picture. It blessed me to look at those pretty flowers this morning. Simple pleasures : ). I love hydrangeas too! They always remind me of my aunt who had a yard full of them. The huge blossoms, the many colors, such a work of art! The bride will love it! The flowers are gorgeous! Thank you for my lesson of the day! We are truly blessed! Gorgeous! I love hydrangeas. Who doesn't? What a beautiful way to be reminded of God's love...thank you! I never liked hydrangeas growing up b/c my mom had them EVERYWHERE in the yard. But now that she has passed away, I can't help but like them. Thank you for this post. I needed it! The flowers are gorgeous but they pale in comparison to your beautiful words! Have a blessed week! 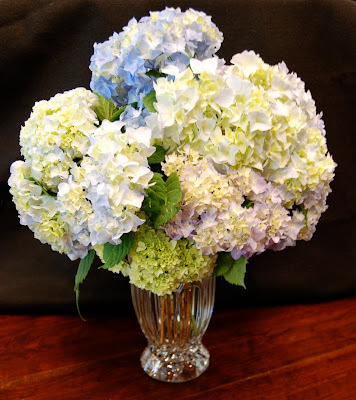 Opening this post and seeing those stunning flowers made me mention to hubby that we need Hydrangeas in our yard. Love your arrangement. God is truly a master artist. Hey thanks for the visit to my blog, and for commenting. Your blog is beautiful, and inspiring, and I feel like we could be friends. I'll be back for sure, and those hydrangeas....to die for! Mine haven't popped yet, but they're on the verge, and I can't wait. I can't believe you grew those. Hydrangeas are one of God's most beautiful creations, definitely. Everything about this post is beautiful. thanks for sharing your beautiful hydrangeas and thoughts. I LOVE those hydrangeas! I am amazed they are all from one plant. Would you mind telling me what kind of hydrangea that is? I would LOVE to plant some in my yard. We have the perfect place. And I know now that every single time I see them I will think of your wonderful comments that God is sharing all this gorgeous creation with us, his other gorgeous creation :) you can email me at juliabrianne@gmail or comment on juliasbabysteps.blogspot. My very FAVORITE flowering shrub! They are beautiful fresh and dried - what more could you want! They have always been my favorite! Richella, those flowers are amazing! Simply beautiful colors and huge blossoms. You brought a smile to my face, that's for sure. Gasp! I want to plant a hydrangea bush immediately. They are my favorite but I don't have one. Luckily my neighbor does and sometimes I "borrow" her blooms. Yours are beautiful! Gorgeous!! I love hydrangeas. And the creativity of the Lord never ceases to amaze me! What beauty He created for us to enjoy! Enjoy your blooms :)! Beautiful post. Love hydrangeas too! He chose to show it and it is fabulous! I LOVE hydrangeas too! We have two that have not been producing for the past several years. After talking with a gardner and getting some advice, I was ecstatic to discover that one of my plants has numerous blooms on it! Yahoo! It'll be so fun to see what color(s) we have. But I'll have to wait for them to bloom...late summer/fall bloomers. Yes, the Master Designer is the most talented artist of all. How kind He is to share His beautiful handiwork with us. Blessings, my friend! Gorgeous. Reminds me of my best friend's wedding many years ago -- she had all hydrangas. Every time I see them I think of her. Richella they are truly a work of art. They are beautiful! love it! I'm a hydrangea junkie! I love me some Hydrangeas! We had some in Georgia that were purple and I would always cut them and put them in a vase. They are beautiful! Can you believe I do not have a hydrangea bush? I've got to get one! I am absolutely in love with them. My niece is going to have blue hydrangeas in her wedding. :) Only God could create a flower so beautiful! What a beautiful post, Richella, I love the tone of the blooms, different, and yet they work beautifully together. Oh Richella those are beautiful! We are using blue and green hydrangeas in Courtney's wedding. We love them!!! That looks absolutely gorgeous! Hydrangeas are so pretty.